The main concourse area blossoming and decorated with hanging red lanterns, peonies, and many types of flowers, there are rattan tables and chairs for shoppers to take a breather after a long day shopping, play chess, or you can take photos there too. 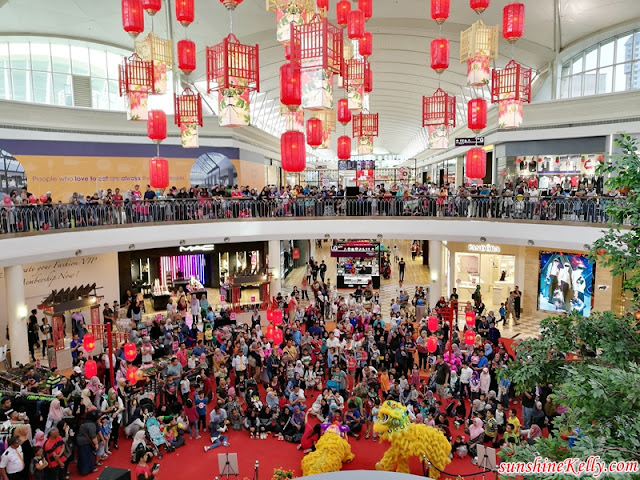 I personally find it very relaxing sitting here while enjoying watching people shopping, children playing and also Chinese New Year songs playing at the background. This Chinese New Year, Alamanda Shopping Centre has prepared a list Prosperous Performances from 26th January to 9th February, 2019. Hey shoppers! Don’t forget to redeem your rewards after your shopping ya. For Daily Good Fortune Rewards, when you spend RM688 & above in a maximum of 2 receipts at any specialty store to receive a candy tray and a pack of red packets. 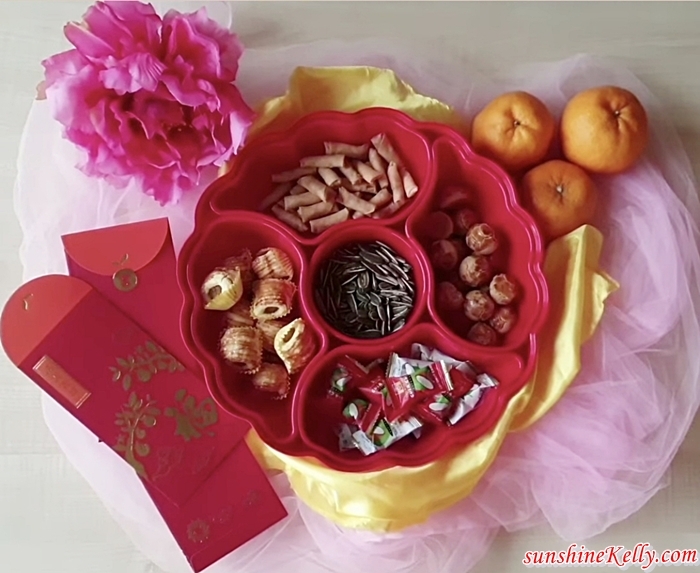 I have a set of the Candy Tray and it’s so classic, going to use it this Chinese New Year. 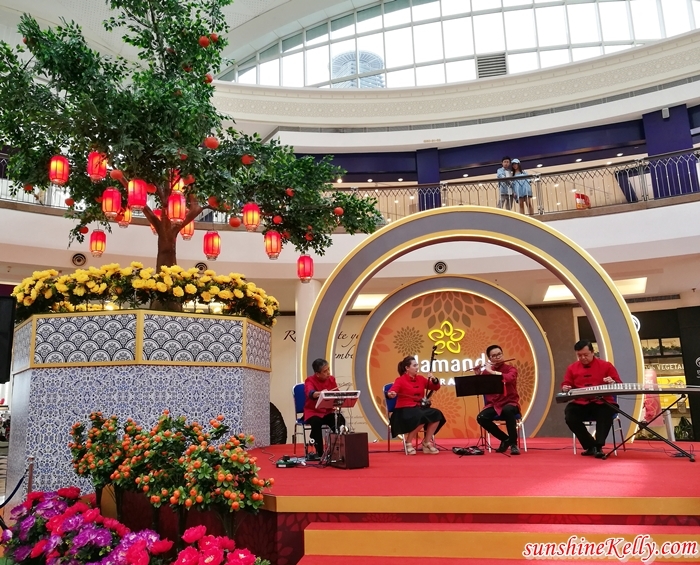 Alright, that’s about it, I had fun time and a Blossoming Day at Alamanda Shopping Centre recently. If you and your family are heading there for your groceries, shopping or makan makan do take more photos. 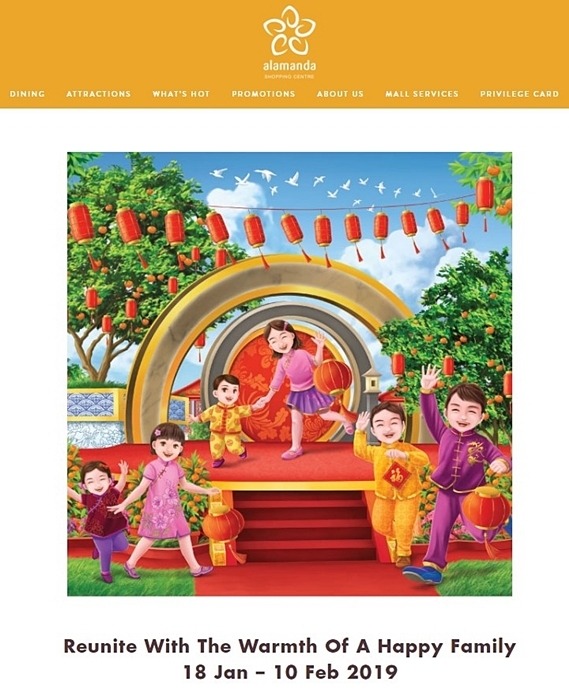 I wish you all Happy Chinese New Year, Gong Xi Fa Chai and Happy Holiday! Jom singgah Alamanda sekejap ambil mood Raya Cina. Wahhh havent going there for a while since gave birth last month and due to confinement period.. look sooo pretty. Now its so pretty with the lanterns and flowers blooming. Waaa.. Menarik la deco di Alamanda ni. Semangat nak raya tu mesti makin membara kan kelly bila tengok deco yang cantik macam tu. 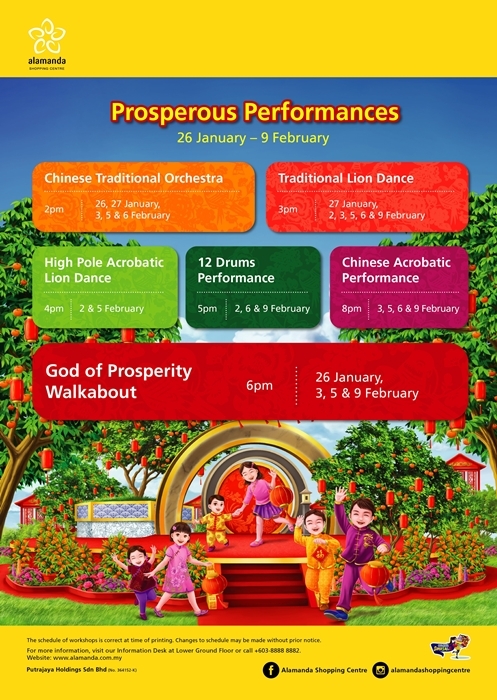 cantiknya..nampak sangat meriah..Happy CNY Kelly..
you are welcome, hope you can drop by too. Nice place. Looks interesting. Will go visit there soon. Woww.. Cantik dekorasi dia. .you pun pandai amik gambar. Suka tengok dekorasi shopping mall buat. .
Alamanda has very beautiful deco right? I love the deco and it feels so homely - just like the old China movie. I think the last time i went to alamanda was 2017, haha. that is long time ago. By the way the decoration is nice, and you're as always,, so pretty and gorgeous. Wah nampak happening lah shopping mall Alamanda . Cantik dekorasi tanglung tuh .selain tu banyak juga aktivti yang diadakan .Ada reward pulak untuk customers. Yes, there are many rewards for shoppers. It has been awhile i didnt go to Alamanda. The CNY decorations there are very beautiful. I will stop by there today. I almost forgot how Alamanda look like. Tengok kat sini, next year boleh pergi ya. Cantiknya alamanda. Dah lama jugak tak pegi alamanda. Decoration so nice and very suitable for the family to take photos together with. Oh yesss i forgot last time when you work in Cyberjaya you always go there for lunch. I have never been to this shopping mall before. The decorations look really awesome for Chinese New Year theme. The lanterns look dainty while the rattan table with Chinese Chess board was really a thoughtful touch. Betul, I was resting there and if go kaki boleh lah main chinese chess kan.
wah... the decoration there looks so traditional and beautiful!! so much activities there ya.. gonna drop by to check out the place and grab some photos. Happy Chinese New Year and hope you take many photos there. Hopefully one day you will visit Alamanda.